Floating at the center of this cool space wallpaper is a lidless purple eye, staring back at us through space. This ethereal object, known officially as [SBW2007] 1 but sometimes nicknamed SBW1, is a nebula with a giant star at its center. Floating at the center of this cool space wallpaper is a lidless purple eye, staring back at us through space. This ethereal object, known officially as [SBW2007] 1 but sometimes nicknamed SBW1, is a nebula with a giant star at its center. 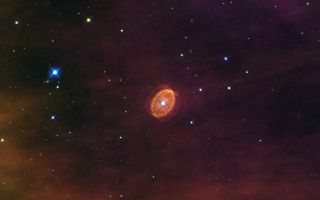 The star was originally twenty times more massive than our Sun, and is now encased in a swirling ring of purple gas, the remains of the distant era when it cast off its outer layers via violent pulsations and winds. But the star is not just any star; scientists say that it is destined to go supernova.